Last modified on December 5th, 2018. 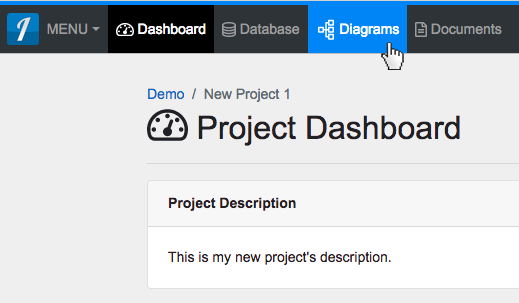 From your Project Dashboard, within any project, you can access 'Diagrams View' by clicking on the 'Diagrams' button in the top navigation bar. A link to 'Diagrams' is also available in the ‘MENU’ drop-down on the top left of the navigation bar, under the ‘General’ heading. 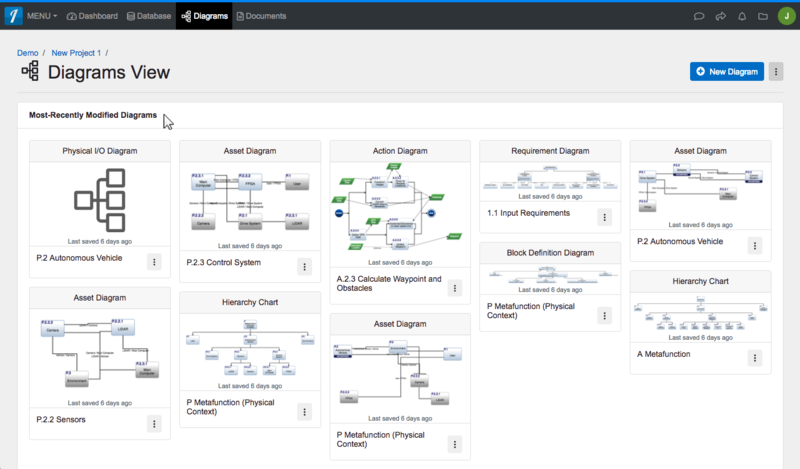 Creating Diagrams Creating a diagram allows you to add a new LML, SysML, or General diagram to your selected project. Deleting Diagrams Deleting a diagram permanently removes just the diagram from your project’s database. The root entity and any relationships it may have will remain intact. Filtering Diagrams Filtering diagrams allows you to show 'All Diagrams' or only specific types of existing diagrams within your project. Refreshing Diagram Images Refreshing a diagram’s thumbnail image forces the thumbnail to be re-generated to reflect the latest changes in the diagram. Renaming Diagrams In 'Diagrams View,' you have the ability to rename an existing diagram (root asset) as well as edit its number, description or label. Searching for Diagrams Using the ‘Find a Diagram’ feature within ‘Diagrams View’ allows you to search for an existing diagram by Name, Number or Description. From your Project Dashboard, within any project, you can access ‘Diagrams View’ by clicking on the ‘Diagrams’ button in the top navigation bar. A link to ‘Diagrams’ is also available in the ‘MENU’ drop-down on the top left of the navigation bar, under the ‘General’ heading. Filtering Diagrams Filtering diagrams allows you to show ‘All Diagrams’ or only specific types of existing diagrams within your project. 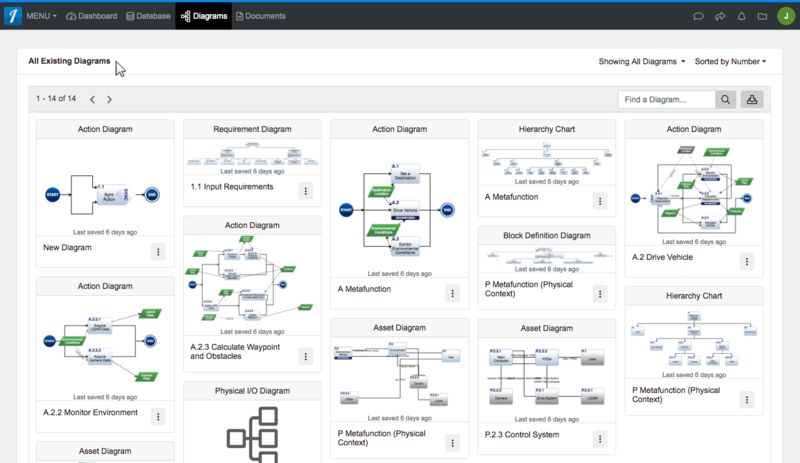 Renaming Diagrams In ‘Diagrams View,’ you have the ability to rename an existing diagram (root asset) as well as edit its number, description or label.